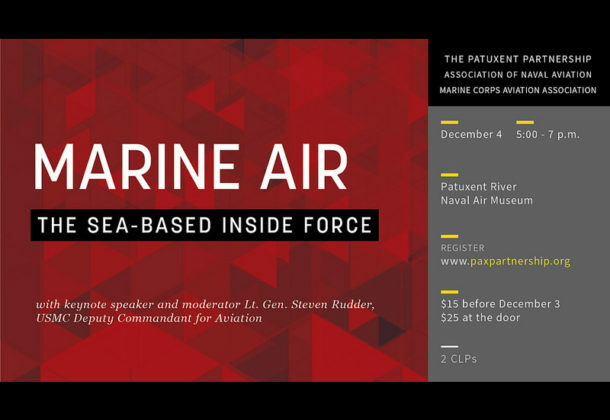 Join The Patuxent Partnership next Tuesday, Dec. 4, 2018, at the Patuxent River Naval Air Museum for the TPP-ANA-MCAA panel, “Marine Air: The Sea-Based Inside Force.” Register on the TPP website. Pay by noon Dec. 3 for $15 or $25 at the door. The event will run from 5 to 7 pm. Attendees will be able to hear introductory remarks by Brig. Gen. Gregory L. Masiello, USMC, Program Executive Office for Air Anti-Submarine Warfare, Assault & Special Mission Programs, (PEO(A)), and the keynote speaker and moderator for the event, Lt. Gen. Steven R. Rudder, USMC, Deputy Commandant for Aviation, Headquarters Marine Corps. TPP has a special addition to this panel, as donations of non-perishable food items for H.O.P.E. of Southern Maryland food pantry will be collected. Attendees can bring holiday-related items, or any kind of non-perishable food. The sponsor for this panel is Bell. The Patuxent Partnership, 22335 Exploration Drive, Suite 1035, Lexington Park, MD 20653. Admission for attendees who register in advance but do not pay the fee is $25. Registrations at the door will also be $25. There will no refunds offered. If there are any proceeds from the event after expenses, the extra money will go to The Association of Naval Aviation’s Squadron No. 18’s and the John Glenn Squadron of the Marine Corps Aviation Association scholarship funds and other STEM programs and initiatives in the three Southern Maryland counties.